Was in the old days lost — and won. And the men of ‘Fifty-four. The day of the Good Fight. In the brave days that have been. When our hearts with hope were high. In that golden time gone by. Ere their like are seen again. In the year of ‘Fifty-four. With their horse and foot police. And they almost broke our hearts. Sent a regiment in reply. But we dared it all the same. And who sealed it with their blood. Was the leader of us all. He would never see again. Such a feeble fort before. Slept upon the fatal hill. And the hours crawled slowly be. But a sentinel was I.
O’er the Mount of Warrenheip. Rang our picket’s warning gun. And each man was at his post. There was no blare of trumpet. And there was no tap of drum. And the Blackcoats looked like Death. Fired as if upon parade. Struck down valiant Captain Wise. And with bayonets fixed they came. Like a wall devoured by flame. All alive with stabbing steel. Perished, fighting in the van. 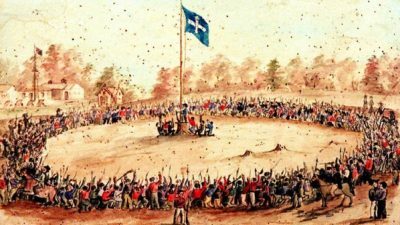 In the first Australian Fight. And upon that Redcoat lay. Died before the week was done. Charged to guard a kingdom’s gate. For they could not conquer Fate. Found them lying side by side. And good mates together died. And the Pikemen broke and fled. Ever seen beneath the sun. And the muskets rang their knell. Lay our jester ‘Happy Jack’. As we gazed upon our dead. Flung their useless weapons down. Through the Stockade’s bloody dust. God rest you, Peter Lalor! Was your bright and gallant soul. When a price was on his head. First published after his death in The Bulletin, 19 January 1911, p43. 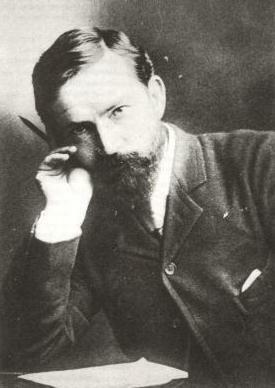 Victor Daley, a journalist, became one of the pre-eminent Australian poets of the 1880s and 1890s. He serves as a lyrical alternative to his contemporary bush balladists of Henry Lawson, Banjo Paterson, and Will H. Ogilvie.